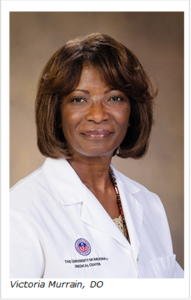 Pima County Medical Society member Victoria Murrain, DO, has been appointed deputy dean for diversity and inclusion at the University of Arizona College of Medicine – Tucson. The appointment went into effect Dec. 3; Dr. Murrain previously held the title of interim deputy dean since January 2018. As deputy dean for diversity and inclusion, Dr. Murrain will serve as chief diversity officer for the college and, with key stakeholders, develop a sustainable plan to implement clear policies and strategies pertaining to diversity and inclusion. Dr. Murrain will develop and implement new initiatives and programs that focus on building cultural competence and dialogue; establish metrics to measure if outcomes are meeting the college’s diversity-and-inclusion vision; and identify methods that effectively sustain an environment that is inclusive and productive for all students, trainees, faculty and staff members at the college. Dr. Murrain also is assistant dean for graduate medical education and associate professor of family and community medicine at the UA College of Medicine – Tucson. She received her DO from the College of Osteopathic Medicine of the Pacific (now Western University) in Pomona, Calif. Special areas of interest include diversity, community medicine, maternal-fetal medicine and community engagement. Dr. Murrain is fluent in Spanish and is a strong advocate for the provision of health care to the underserved.